The DreamSpa is a personal phototherapy system that uses light to create energy in the body. This advanced technology is now available at Skin Care Plus. Light is a nutrient for the body. Just as plants need sunlight to thrive, humans need light to maintain health and well-being. Human cells are activated by particular wavelengths of light called photons. At the cellular level, photons transform into life-force energy. Red LED light has been shown in numerous studies to stimulate the production of collagen, deliver more oxygen and nutrients to the skin. Customers report fewer lines and wrinkles and a smoother, lovelier complexion. 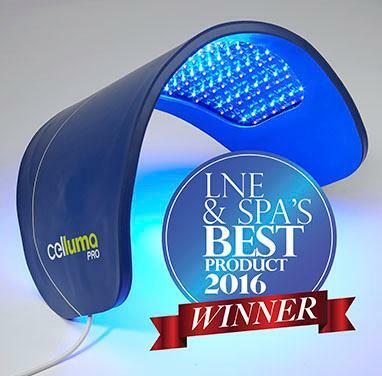 Blue LEDs are used by professional estheticians to reduce acne. The body relief mode offers a combination of blue and red LEDs reducing the most significant culprits in the fight against rosacea: redness, flushing and dilated capillaries. Pineal Gland and Light. Few people realize that the pineal gland is in fact a literal eye.The pineal gland is a pea-sized gland in the exact center of the brain and comes from the root word “pinea” which is Latin for “pinecone.” Pinecone/pineal symbolism appears all over the ancient world. Why are so many ancient cultures obsessed with pineal symbolism? The answer may be found inside the gland itself. The interior of the pineal gland actually has retinal tissue composed of rods and cones (light receptors) just like the eye. It is even wired into the visual cortex in the brain. Natural, unfiltered light is necessary for the proper functioning of the pineal. The pineal gland converts light energy into an electrochemical impulse which feeds directly into the hypothalamus. The hypothalamus mediates all of the vital processes of the body through it’s connections to the pituitary gland and the autonomic nervous system. The hypothalamus is filled with light sensitive cells which convert the electromagnetic signal of light into a neurochemical impulse, which is then carried directly into the pituitary gland. Is it a coincidence that the organ that has for thousands of years been called the 3rd eye actually has all the components needed for a functioning eye? Unfortunately for many of us, the pineal gland can become calcified from heavy metals and fluoride. Avoid fluoride and heavy metals, spend more time outdoors, limit the amount of time you wear sunglasses and regularly use your DreamSpa. The DreamSpa delivers beneficial light to the pineal gland. Power Nap with DreamSpa. The benefits of naps cannot be overstated. Past studies have shown a nap can help us recuperate lost hours of sleep and restore our worn-out synapses. Scientists from the University of Michigan are looking to add to this body of research with their latest study, which argues the benefits of naps during office hours. Each DreamSpa session feels like a night of deep sleep. Our innovative Brainwave Entrancement™ feature lulls the brain into a profoundly restorative 5Hz theta. Brainwave research has shown that is the “Miracle Zone” where the brain repairs and reboots itself. Emerge from your DreamSpa session thoroughly relaxed, refreshed and re-energized. Coconut water is an excellent way to hydrate, as it naturally replenishes electrolytes. Boost the efficacy of your DreamSpa sessions by drinking coconut, or mineral rich, or electrolyte enhanced water. The mitochondria in our cells look and function like a wet cell battery. Electrolytes enable the body to absorb and retain more light energy. Not all brands of coconut waters are the same. There can be a big difference in quality and even ingredients. “The DreamSpa has significantly improved my energy level on a day to day basis. The energy improvement has been profound on days that I am exhausted. I rely on the DreamSpa to help me function on those days. It has taken a few months, but now I am noticing improved cognitive functioning and thinking skills,” Robert Bolleter, Tucson, AZ. To learn more about the DreamSpa, or to schedule your first session, please contact Joan Kesman at Skin Care Plus. Call 630-655-3345. Skin Care Plus has always touted the importance of personal and natural skin care products. A company in London, however, uses a high-tech process, including DNA analysis, to prescribe skin care products that match your genetics, chemistry and skin care needs. The skin care company is called GeneU. The London-based clinic adds a sample of your saliva to a small microchip. The test is complete in just 30 minutes. It analyzes two genes–one that regulates how fast your body degrades collagen and the other deciphers your predisposition to antioxidant protection and anti-aging. Results are entered into a computer, which recommends two of the company’s 18 skin care serums that best fit your needs. The cost is about $940 (including the test and a two-week supply of skin care serum). Double-blind clinical trials over 18 months suggest that GeneU reduces fine lines and wrinkles by up to 30 percent in 12 weeks, Dr. Toumazou said. The results have not yet been published. GeneU isn’t the only company offering skin care tailored to genetics. SkinShift in Austin, Tex., outsources its $99 DNA test, then suggests some combination drawn from an available pool of four serums and five nutritional supplements. None cost more than $75. Skin Care Plus doesn’t make any judgements of these companies, but we do find it interesting that the theme of personal skin care continues to gain traction. We support that revolution completely. Be sure to tell your friends, family and co-workers that we offer free personal skin care analysis (by phone or in-person) as part of our personal and natural skin care consultation and treatment. We ship products to customers around the world. We also offer the best facial in the greater Chicago area, including Batavia, Geneva, St. Charles and Wheaton. More and more people are concerned about the impacts of skin care products and their ingredients on their health and the environment. Destructive practices and fraudulent claims are tougher to conceal in the age of social media. That single force could be the most dynamic issue in the skin care industry in the foreseeable future. As we have explained in our blog before, many skin care products can harm you. In fact, many contain petroleum products and other harmful chemicals. Many skin care products contain ingredients that are known carcinogens, while others dehydrate your skin and cause other forms of damage to your overall health. Some creams and lotions contain collagen from livestock, which the food industry consider a specified-risk material for mad cow disease. Other skin care products include petroleum-based ingredients. Regulations in the skin care products industry are weak and oversight is even weaker in most countries. Your best bet is to do your research. Learn the issues that concern you and shop wisely, while informing your friends and family of the hazards. The risks are real. Other skin care trends? According to their beauty blog, Marla Malcolm Beck, founder of M-61 Laboratories, thinks that personal technology will change the skin care industry drastically. Dermatologist Craig Kraffert, MD, of Amarté Skin Care, says the days of heavy sunscreen may soon be behind us. And, who wouldn’t want their SPF to glide on as smoothly as moisturizer? Organic skin care ingredients will soon be mixed with lab-created ingredients to create new hybrid products. And, SPF is just the beginning. You’ll be able to use foundations, concealers, lipsticks, and more with powerful skin benefits, like anti-aging and acne control. Ling thinks so, too. “I see the skin-care industry becoming more niche,” she says. “Rather than the conventional, large day spas, spa owners will specialize in one or two treatments. It will be about catering to very specific needs.” We’ll take that over a chocolate facial any day. Editor’s Note: We’re reserving judgement on the SkinPen until we can conduct some research on our own. However, you can’t deny that the technology is making waves in the media world at the moment. Like most skin care treatments, time will see if the rewards are lasting and if they outweigh any risks (I’m concerned about the inability to sterilize the needles from some human pathogens). Here’s how it works. First the skin is numbed. When the pen is placed on the face, 12 stainless steel needles create thousands of microscopic incisions. This allows for contraction and tightening, and helps products penetrate the skin. St. Louis says the skin will initially be a little red and puffy, similar to a sunburn. After three days, however, the skin is better than normal, she said. “I did it on a Friday, and on Saturday I was back to charity work,” customer Julia Stocker told WFAA. “This has true results, and they are immediate”. But it’s not just for wrinkles. The SkinPen can treat acne scarring, hyperpigmentation, fine lines, sun damage and stretch marks, according to Bellus. And it can be used on more than just the face. Patients have received treatments on the neck, arms, hands, legs, abdomen and back. As for other treatments, microdermabrasion scrapes off the top level of skin, allowing for greater cellular turnover, and a slower aging process. It costs about $150 with a recovery time of three to five days. Peels entail a chemical solution applied to skin. Over time, top layers of skin peel off, allowing for new skin to grow in. It costs $200 to $300 with a recovery time of three to 14 days. SkinPen needles create thousands of tiny incisions, creating new collagen. It costs $300 to $400 with a recovery time of one to three days. Perhaps the biggest difference is the recovery process. “You can get dynamic results with little or no downtime,” Proctor said, adding that SkinPen patients can easily return to work the same day as their treatment. The number of treatments a patient needs depends on their specific issue. Patients can receive the treatments about a month apart.